Guest: Eno Nsima-Obot, M.D., physician, life coach and author…. “It is possible to live well and to thrive with a chronic illness such as Type 2 diabetes. By that I mean enjoy a life which is full and enriching as ever,” states Dr. Eno Nsima-Obot, winner of this past year’s Book Excellence Award in the medical category, an international awards competition giving authors the opportunity to showcase their work on a global platform. 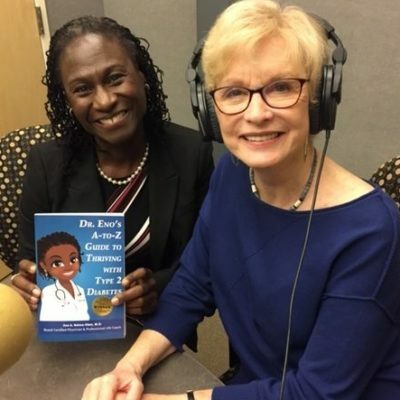 On this program, Dr. Eno Nsima-Obot shares highlights from her award-winning book, “Dr. Eno’s A-to-Z Guide to Thriving with Type 2 Diabetes.” Her book presents the questions that plague many of her patients. In addition to being a physician, Dr. Nsima-Obot is also a trained professional life coach. It is this combination of skills that leads her to help her patients focus on wellness and healthy living rather than disease. “Once you’ve been diagnosed with Type 2 diabetes, a healthy lifestyle is essential to your long-term health and well-being,” explained Dr. Nsima-Obot.